It’s the stuff of nightmares. But every week in Australia, five children – mostly aged under five – are admitted to hospital after swallowing button batteries. It takes as little as two hours for a battery to cause severe damage. At worst, it can be fatal. Just ask mum Karla Rauch, whose son, Emmett (above), swallowed a button battery not long after his first birthday. It’s taken four years and 65 operations for her little boy to be able to eat, play and breathe like any other child his age. In a column for Today, Karla describes the long, difficult road since her family came close to losing Emmett in 2010. It was only the intuition of a paediatrician that led to an X-ray and discovery of the round lithium battery stuck in Emmett’s oesophagus after he became feverish. 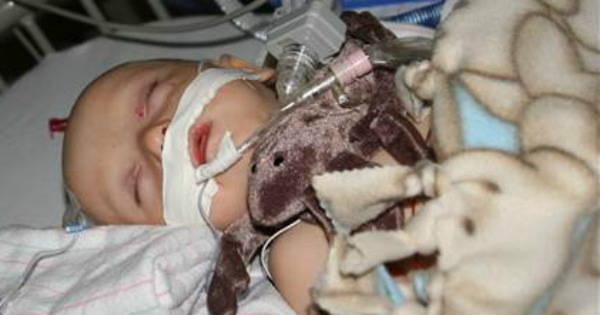 After the surgery, Emmett’s heart stopped. 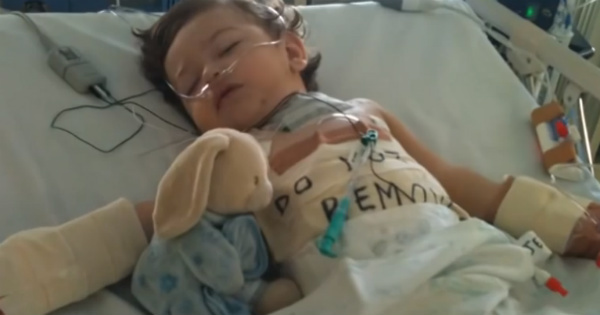 He was revived, but was touch-and-go in intensive care for eight months. The battery destroyed his oesophagus – which has since been recreated from his colon – and paralysed his vocal chords. He speaks with false vocal chords and has a feeding tube, and is relearning to swallow. But he’s alive, and for that his mum will be forever grateful. What happens when a child swallows a battery? In a video produced for Australian campaign The Battery Controlled, paediatric surgeon Dr Kelvin Choo explains the danger is not in the battery’s size or potential for chemicals to leak out, but the fact it gets stuck and has an electrical charge. “The electrical charge, when it’s stuck in your tissues, causes heat, and heat causes damage. In as little as two hours it can cause a significant burn inside your stomach or your oesophagus or your bowel,” the Queensland surgeon says. Even a flat battery is dangerous. There might not be enough charge to run your remote control but there will still be enough charge to cause significant damage inside a child,” Dr Choo says. The video features baby Hunter, who swallowed a lithium battery unbeknown to his mother as she fetched a bottle. At first his parents thought he might have the flu; then a scan showed up what was thought to be a 10c piece. He was rushed to a children’s hospital once doctors realised what was really making him so ill.
Like Emmett, Hunter had emergency surgery to remove the battery. But it had already burnt a 2cm-diameter hole in his oesophagus and into his windpipe. Dangerously, everything he was swallowing – food, drink, saliva – was going straight into his lungs. It had already caused a bad lung infection. He had surgery to bring his oesophagus out through his skin, so all his saliva could be diverted into an external bag. A feeding tube was linked to his stomach. Later, the hole was repaired but two-thirds of his oesophagus was removed. It was rebuilt using his stomach. It took 12 months to get him right again, with the final step removing his feeding tube. “Fortunately he’s come through it very well but at any time during the major operations things could have gone wrong, we’ve been very lucky,” Dr Choo says. How can parents protect children from button battery risks? Australian Competition and Consumer Commission deputy chair Delia Rickard says parents need to be aware of the risks of button batteries, which are typically found in household items such as remote controls, car keys, kitchen scales and toys. “These are really dangerous and if a kid does swallow one they need to get to emergency ASAP,” she says. The ACCC’s Product Safety Australia has been working with electronics regulators, the battery industry and toy makers to improve packaging and safety. It is also working with medical colleges to make sure doctors are aware of the risks and signs, as diagnosis can be difficult. She says parents should regularly check that battery compartments are properly screwed in, avoid leaving devices lying around, and discard flat batteries immediately. If parents or carers suspect a child has swallowed a button battery, don’t let them eat or drink or induce vomiting – just get them to hospital. You can also contact the Poisons Information Centre in your state on 13 11 26. Get more information at Product Safety Australia and Kidsafe Australia.